Main Street. It’s the culturally diverse epicenter of life in Bozeman. Home to Music on Main, Bobcat Fest, the Sweet Pea parade, and a slew of other oft-celebrated events. But, what happens when you leave the confines of this street? What happens if you turn down the block and explore? If you’re lucky enough to take your adventurous turn down South Willson Avenue, you’ll stumble into a local gem: Naked Noodle. 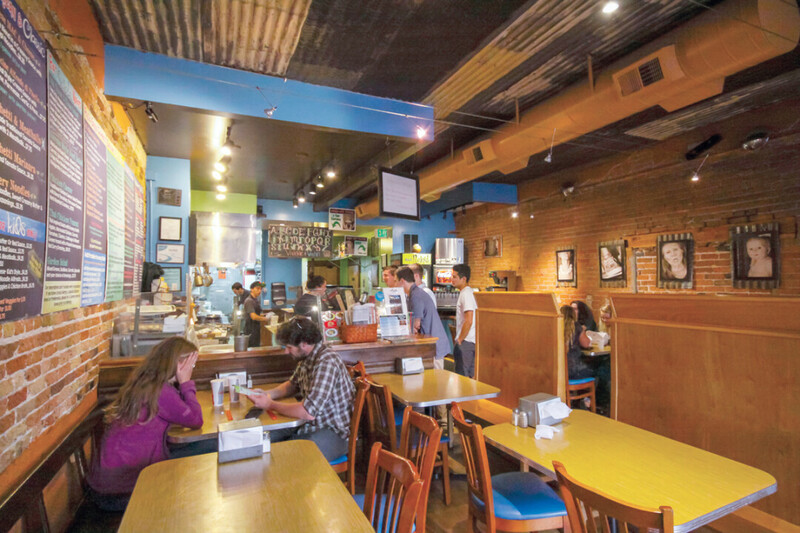 Tucked into a cozy brick building, you’ll find what has been a craved staple among Bozeman foodies for over 13 years. It’s a place of fun, laughter, and a culinary experience unlike any other. 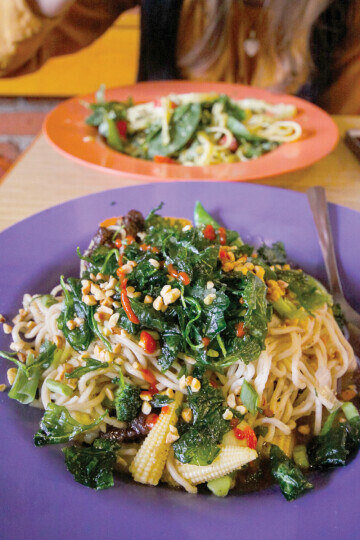 Joe Cobb, and his wife Nong, pride themselves on the tradition of the Naked Noodle, but also on the ways they have been able to innovate it during their stint as owners. A conversation with Joe about the Noodle, as it’s commonly called, is to step into the experience of his unique restaurant. CM: What made you want to be in the restaurant business? JC: Oh gosh, well, it all started when I was 14. I was a chef in many different places. I’ve worked at Chico Hot Springs, The Gallatin Gateway Inn, and a slew of others. I also got into real estate, which is actually what I do full time. Now, the story of the Noodle begins on September 12, 2003. That’s the day they opened. They delayed it from September 11 because they didn’t want the restaurant to be connected to the stigma of that day. We, my wife and I, got it just before the recession, so it was literally feast or famine at that point. We have owned it now for eight years. I don’t know if you know this, but my wife is Thai. We actually met at a fundraiser she organized to help Thailand after the tsunami hit. And, she is a big lover of food. When we were presented with this opportunity, we analyzed everything. We tasted all the food, and really looked at the logistics of the space before we decided to buy it. When that was all said and done we kind of looked at each other and realized that we could really do something good here. With my cooking background and her Asian influence, we just knew we could take this and elevate it. We could turn this place into a fantastic, great experience for our customers. CM: Oh! That actually leads beautifully into my next question. What is it you want people to experience when they come to Naked Noodle? JC: It is a sensory experience. It’s the flavor. It’s the scent. It’s the interactions people have in the restaurant. It’s everything. 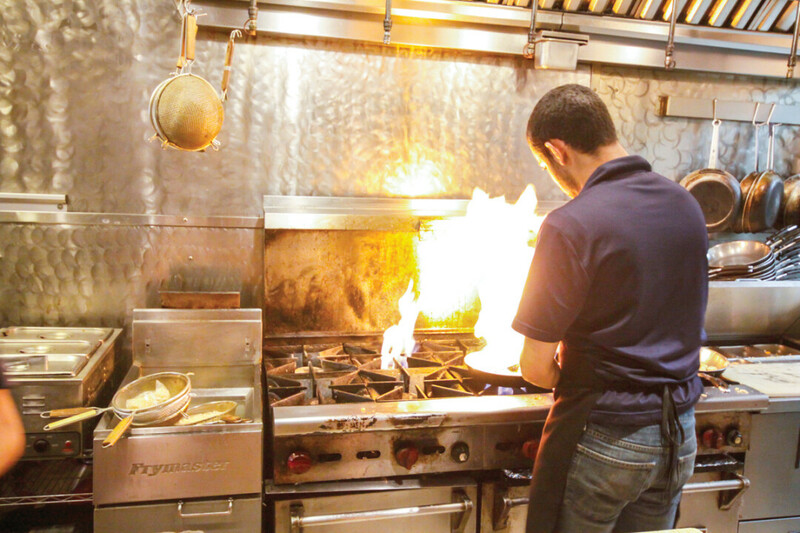 When we bought the space, we really wanted to make sure that we maintained the original recipes that everyone loves. They had such a following in this community. We kept the Gaucho, the Four Cheese Mac and Cheese, The Stinger, the Sugo, and Zorba the Geek just to name a few. But, we also really wanted to capitalize on bringing Asian dishes to the menu, like curries. When you taste a curry, it should be an experience. It is multi layered. You shouldn’t take a bite and only taste coconut milk. You should get hints of the lemon grass, the lime leaf, all the herbs and garlic in there. With the help of my wife, we were able to create some really awesome Pad Thai and green curry. I think we have the best Pad Thai in town. In fact, I jokingly proposed a wager with some of the other restaurants in town to have a “Pad-Thai-off” just to prove it. And my wife is all to thank for that. This is definitely not just about me. She will let her base broth cook for two days, letting all those spices and seasonings just simmer in there together. So while the food is the heart of this, there’s so much more to the experience. It’s also the price point. There’s a strong price-value association when people dine with us. When you look at the portion size, the price, and then taste the textures and flavors, it’s unlike anything else in this town. In the past eight years, we’ve only had to raise our prices twice, and it’s just been small raises, a dime or a quarter here to account for the cost of ingredients going up. There’s also that ability to customize dishes that people love. When they get the choice of add-ons, it makes the dish unique every single time they eat here. And some of our add-ons, like the fried spinach, have seriously devoted fans. People will call and tell us “Hey, we’re coming in to eat. Is there still fried spinach?” If there’s not, they’ll plan to eat with us tomorrow. Of course, we do our best to keep it available and meet the demand. Even if you don’t like spinach, you’ll like our fried spinach. It has a secret blend of spices and seasonings that make it something really different. It’s also got this potato-chip-like crispiness that people love. We’re not trying to be something we aren’t. We’re not fancy. Yes, we make you bus your own tables. But that means it’s something different every time. That’s the pinnacle of the experience for me. CM: So, what would you say makes the Noodle unique to Bozeman, in this food community? JC: Well, we love being in that downtown area. We’re a local’s favorite. According to Café Courier, we’re the number one takeout restaurant in Bozeman. We have a one-of-a-kind concept here. People get the sense that we’re home grown and organic. Like, we wouldn’t do well in a mall or something. We are a good fit for Bozeman. The Noodle really complements the feel and culture of downtown. Even our slogan is unique, right? Eat Naked. It’s on everything. We give out these little cards that tell you to “eat naked” with us. It’s even in our radio ad, right now. Michelle, on the ad, asks people if they want to eat naked and then there’s this great pause; it just kind of hangs there for a moment. Then, our ad starts and it creates this fun moment for people. That’s our whole goal. The experience of ordering is also pretty unique to us. You can actually watch the transformation of someone who’s ordering for the first time. They come in, stare at the menu for a minute or so, a bit overwhelmed, and then order something hastily. They get their drink, find their seat, then suddenly hear their name being called. They rush up to grab their food and are met with that option for the add-ons. You can see the surprise in that. They think it’s over, get their extras, then sit down to dig in. As they start eating, that’s the moment. You see them look at their food, look back to the menu for the price, and realize how much value they are getting from their meal. It’s really a joy to watch that happen. On top of that we have a really great staff. Our manager, Lynn, she’s just wonderful. We work hard to get a staff that’s friendly and outgoing. We used to do this thing called Mullet Monday. All the staff would wear mullet wigs and anyone who came in with the haircut got a percentage off their food. We’ve also done Mustache Mondays where the staff wears like fake fu Manchus, big biker mustaches, things like that. Within reason, we encourage our staff to “play” with our customers. It just adds to the experience of the food. Staff-wise, I’d have to say at this point we are running at the best we’ve ever been. CM: Last question, do you have any upcoming events or new things that are happening? JC: Well right now we have student night going on. It’s Wednesday nights for MSU and high school students. They get a meal and a fountain drink for $8. They actually end up saving about $3 or $4, which is a big deal to students. We’ve also put a lot of work into the space. We’ve done new floors, a new dishwasher, and one thing I don’t think people realize is that we’ve redone our patio. It’s a really cool space. When you’re sitting out there, you’re sitting amongst the sweet peas, kale, herbs, and other vegetables that we use in our restaurant. And of course, we’ve got the great “Eat Naked Here” sign hanging above. We’ve also added a new dish, the Gaucho Nacho. So, we serve it up nacho style, but we use that gaucho sauce from our noodle dish that people love. We actually do a lot of our dishes pan-style. We also cater, something that people might not realize. This summer we did a lot of birthday parties, business meetings, even a few river float trips, which was great. We added online ordering to our website and a loyalty program that benefits our local customers. We’ve expanded our gluten free options. We’ve probably seen the demand for that increase by about 150% in the past few years. We also have the salads and the combo options if people don’t want to fill up on just noodles. We’ve got a little something for everyone. Joe and Nong are passionate about what they are creating for the people of Bozeman. They are proud to be a part of the community. They are also the masterminds behind Bozeman’s Firehouse Subs location, which is a whole different food adventure people have to try. So, the next time you’re feeling the desire to wander of the beaten Main Street path, do your best to wander into Naked Noodle. Everyone should be able to say they got to eat naked at least once in their lives.